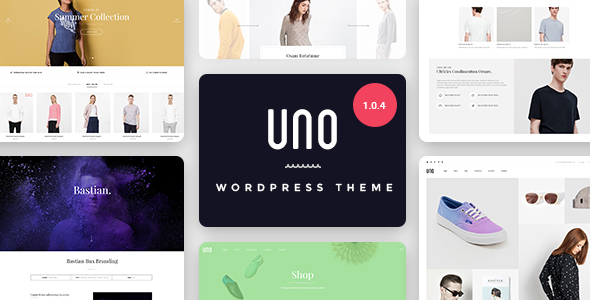 UNO – A “clean style” WordPress Theme, which is built base on 2017 design trending. UNO suitable with any kind of shop, with smoothly elegant layout. Features List: 1. Free Support u0026amp; Updates You will get lifetime update and free support, just ask us then we will help 2. Oneclick import demo Super fast create demo content website with oneclick import demo feature. 3. Fully Responsive Mobile friendly is a must for modern website, UNO is fully Responsive Layout and adapt any screen 4. WordPress Native Customizer UNO is built with native WordPress Customizer, that’s why it is so easy to config layout. 5. Really Retina Display 6. Compatible WPML Easy create multiple language website with WPML support. UNO has been tested with browsers IE9, IE10, IE11, Firefox, Safari, Opera, Chrome, Edge.